A new £1.2 million boat has just come into service as part of a hard working fleet of ‘cutters’ that are busy in the Thames estuary every day, delivering crews and pilots to large ships carrying essential cargoes to and from London and the south east. Estuary Esprit is part of the fleet run by Estuary Services Limited (ESL) – a joint venture between the Port of London Authority (PLA) and Peel Ports. 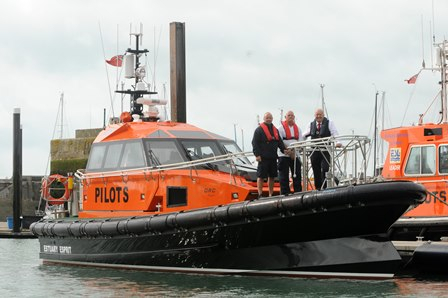 Built by Goodchild Marine Services Limited in Great Yarmouth, Norfolk, she is the first 13.6-metre long ‘ORC’ pilot boat to enter service in the UK. ESL transfers pilots to more than 10,000 ships in the Thames every year, including cruise ships, container vessels, tankers and general cargo carriers. The expert mariners they deliver board ships over 90 metres long, ready to use their in-depth knowledge of the Thames to guide the vessels upriver to dock safely at jetties on the Thames and the Medway. “The Thames and Medway make up one of the busiest port complexes in the UK. A reliable fleet of manoeuvrable boats is essential to give our customers the confidence that we can get expert pilots out to their ships, day in, day out, in all but the very worst weather conditions. The new boat, which can work at Ramsgate or Sheerness, offers substantial improvements in safety and efficiency for all on board. “With ongoing development of marine technology, the ‘ORC’ design offers a range of benefits. The beak-shaped bow allows it to cut through waves, rather than ‘slam’ into them; and the improved hull lines minimise spray, as well as giving those on board a more comfortable ride. It is quieter, lighter, stable in sea conditions and more manoeuvrable, making it safer and more fuel efficient. This boat is already tried, tested and its success proven, with two other ORC design vessels already in service with us. Other ORCs in production at Goodchild’s yard include the UK’s first hybrid pilot cutter, ordered by the PLA for operations at its Gravesend pilot station. • The tidal Thames is one of the UK’s busiest waterways and is home to the country’s second biggest port by tonnage of goods handled. • Estuary Services Limited is a company jointly owned by the Port of London Authority and Port of Sheerness Limited to provide a boarding and landing service for pilots joining and leaving ships trading to London and Medway. • Fast launches based at Ramsgate and Sheerness serve ships at the North East Spit Buoy, Margate Roads Anchorage, the Warps/Oaze Deep and the Anchorages at Southend and the Great Nore.